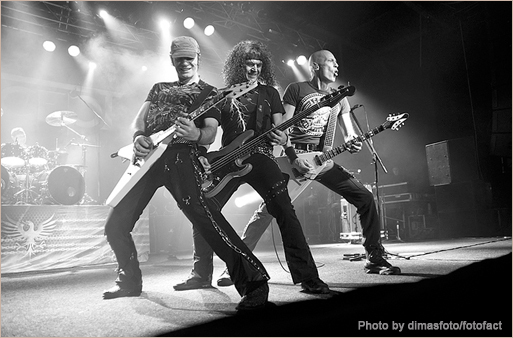 When i first heard about Accept show in Ukraine, i was pretty astonished. My favourite rock band first time in its history would come to Kiev. But there was 5 months left till November, i bought a ticket and started to wait. Price was 25$. Stalingrad tour 2012 was in its height, setlist was pretty good. This fantastic day began with the Meets and Greets with the band in lobby bar of the Kiev hotel. Those fantastic moments are difficult to express by words. Peter and Wolf were so kind to sign all CDs and to take a lot of photos. Then i came to the venue, Stereo plaza club, there was a lot people singing songs, speaking to each other. Audience was pretty mixed, from 10-years old children to solid men over 50 with their wifes. Some hours waiting and i entered a hall, Wolf was just finishing soundcheck. Sound was great. I decided to stand in first row near barriers. ​After a short break, the lights dimmed, intro and taped part Hung, Drawn and Quartered played. A great intro for the band during Stalingrad tour. Then, cutting over the top was that familiar snapping snare from Stefan. The lights came up revealing Wolf, Peter and Herman bent over their guitars then Mark Tornillo walked on stage completeing the band, and the audience clapped and cheered, welcoming Accept in their very first show in Ukraine. The band ploughed through the first three numbers before taking a breath. Setlist was standart and pretty good. 4 songs from Stalingrad album, 4 songs from Blood of the Nations, other – only good old stuff from classic albums of 80’s. While playing Stalingrad Mark came out with Ukrainian flag and then Herman broke string. What a powerful show! For me the highlights were Hung Drawn and Quartered, Stalingrad, Teutonic Terror, Monsterman, Princess of the Dawn. These 5 songs were worth the price of admission alone. Their speed and virtuosity simply blew me away. Wolf’s guitar solo including Hall of the Mountain King was tremendous. During the bass solo in Princess, even barriers didn’t stand for crowd’s pressure and were totally broken. Peter saw this moment and asked people to move back and with smiling face continued to play for the extraordinary joy of crowd. Encores with Metal Heart, Teutonic Terror and Balls to the Wall were accompinied with five thousand voices singing and total madness. Wolf’s guitar solo including Hall of the Mountain King was tremendous. By the way, it was total sold out and this fact added more pride for Kiev show. Everybody after the show was smiling and had a straining voice due to musical excitement. I liked new songs live, Mark is pretty good singer and frontman, Stefan, Herman, Peter, Wolf were fantastic. To sum it up, it was the best show i’ ve ever seen and i thank Accept for it. Using the mobile application Accept by Mobile backstage i learned that guys also liked Kiev show and “definitely want to come back”. That’s fantastic and we are looking forward for a new show.